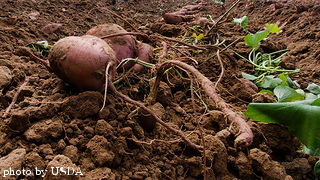 When harvesting sweet potatoes, be careful not to cut or damage them with your shovel or fork. They are more difficult to harvest than vegetables that grow above ground, because you can't see them until you dig them up. The best way to tell if sweet potatoes are ready to be picked is by the appearance of the vines. Typically, the ends of the vines will begin to yellow near at the end of the growing season. When this happens, the potatoes are getting close to being ready. Stop watering and fertilizing and count about 10 days before harvesting sweet potatoes. Use a shovel or digging fork. Follow the vines to their central crown. Insert the shovel or fork into the ground about 18 inches away from the crown. At this point, don't dig anything up, just use the tool to pry and loosen the dirt around the crown. When the ground is loose enough, you should be able to pull up the crown with your hands. Try your best to pull gently enough to where the whole crown comes out with all the potatoes attached. If you think you might have ripped some of the roots, you can dig around in the soil with your fingers to collect any stray potatoes. 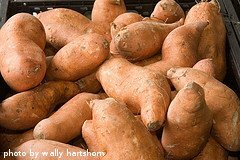 After harvesting sweet potatoes, shake off the excess dirt, but DON'T WASH THEM. washing them will interfere with the curing process. Take the potatoes and store them on a table in a warm (80+ degrees) and dry location for at least 10 days. Generally, the more humid the area, the better. If you can spare some room on the kitchen table, it's an ideal spot for curing sweet potatoes. Make sure there is plenty of air flow around the potatoes. The curing process will help develop the sugars and more importantly, it will also toughen up the skins so they will keep better. After curing, wrap each individual potato loosely in newspaper and pack them loosely into a box or crate. Store them in a cool, dark, dry area. A root cellar is ideal, but most folks don't have those nowadays. A corner of the basement or crawlspace will work, as will a shed or garage if your winters are somewhat mild. 55 degrees F is the best storing temp, but a few degrees cooler or warmer is ok. Check on the sweet potatoes every week or so for signs of rot or soft spots. They should keep for at least 3 months, if not longer. 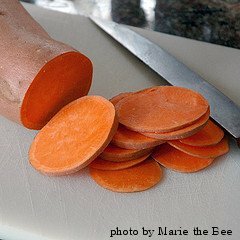 If you want to freeze sweet potatoes, cook them first and then mash up the flesh and put it in air-tight containers or freezer bags. You can also freeze the mash in ice cube trays and then store the cubes in a freezer bag. This way you can adjust the amount and only thaw what you want or need, instead of a whole bag.